How to train with a Volleyball Spike Trainer to Improve Volleyball Hitting Skills - Practice Volleyball contact, arm swing, and footwork techniques. 1. 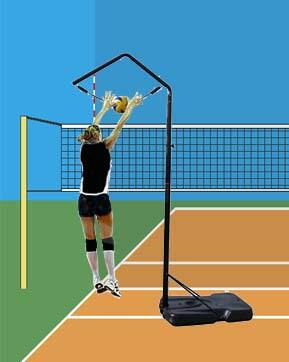 Make sure you are positioned so that the Training Volleyball is squarely between your shoulders. Start about 1 foot behind the Training Volleyball. Focus on the volleyball. Tip: If you have tape, mark this spot on the ground so you know where your feet should be for the start of each repetition as well as the place where they should be when you land. 2. Bend your knees to preload your legs, jump straight up and reach out toward the training Volleyball. This simulates penetrating 1 foot over the net to block on the opponents side of the net. 3. With strong fingers extended, use both hands to touch the upper half of the back of the training Volleyball. The hand closest to the edge of the court (typically the left hand in this training exercise) should be angled in slightly to deflect the Volleyball into the court. 4. Land balanced on 2 feet. Stay balanced and try to land in the same spot you jumped from. Safety Tip: Landing off-balance on 1 foot leads to many knee injuries. TRANSITION FROM BLOCK JUMP to the starting point for a 3-step Volleyball Hitting Approach. 1. Open your shoulders to the Inside of the court ( so you always know and can see where the ball is) and simultaneously open and step toward the starting point for your approach with your right foot. 3. Hop step with your Right Foot, turning in the Air and Landing with your right foot pointing toward the net. Your Left foot will follow your right foot and will also be pointing toward the Net. When done properly, you should always end up in the exact spot and with your feet In the exact location required to start your 3-Step Volleyball Hitting Approach. PERFORM 3 OR 4 STEP VOLLEYBALL HITTING APPROACH (Left.Right..Left) landing balanced and on 2 feet each repetition. WAIT (Rest) for 15-20 seconds Focus on controlling your breathing. Repeat 10-15 time making sure that your form is technically correct. For the last 5 repetitions, do steps 1 thru 3 with no rest in between each repetition. This will simulate a long Volleyball Rally and will help with your cardio conditioning. For the first 10 repetitions use the 4 step method as described above. Safety - Use common sense when working with this or any other training device. Repetitive use injuries are the # 1 injury for college players. When kids are young, their shoulders, knees, etc… are still growing and gaining strength. Please use common sense and do NOT overwork your children. Let them have fun and learn to love the game. Technique: It is VERY important that kids start out with the proper Volleyball Hitting Technique. To ensure your kids develop the proper hitting technique, we recommend that you utilize the training services of trained and capable Volleyball hitting coaches. Our free VolleyballClubDirectory is a great place to find trained Volleyball coaches in the USA. Volleyball Clubs that participate in USA Volleyball. Use it to find a Volleyball Club in your area and contact them about training. Many coaches offer hitting lessons. Ask one in your area.